Do you love Christmas? Me too. Not super big on spending money? Same. And whether you are super into Christmas or not, everyone loves a good holiday party. Here are a few of my favorite concepts for holiday get-togethers with a few basic essentials for decorating and turning things up a bit. Square glass vases (I used 4″ cubes) – $3 ea. LED garland – $5 ea. Red paper poms – $1-$1.50 ea. These pieces are mix-and-matchable for the following parties. I love Michael’s, and I tend to get a lot of my stuff there, but I ALSO really love shopping online (ie, not having to leave my house to get things) – so for that you can turn to Paper Mart. They offer a ton of DIY essentials (which are featured here on the essentials list) that you can order from the convenience of your laptop. Each item is under $5, with some of them closer to $1. BOOM. More money for food, amirite? 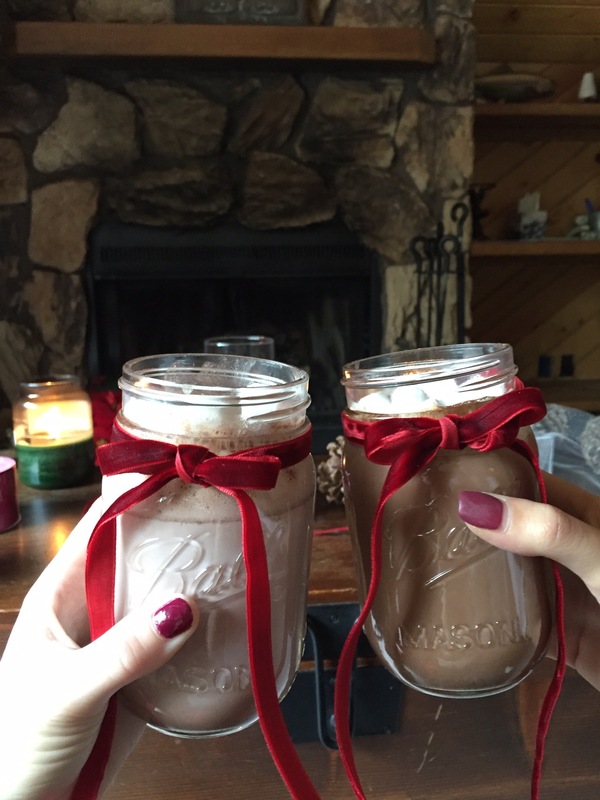 I was just in Big Bear last week with my friend Hailey, and we got creative with some DIY ideas for these parties. 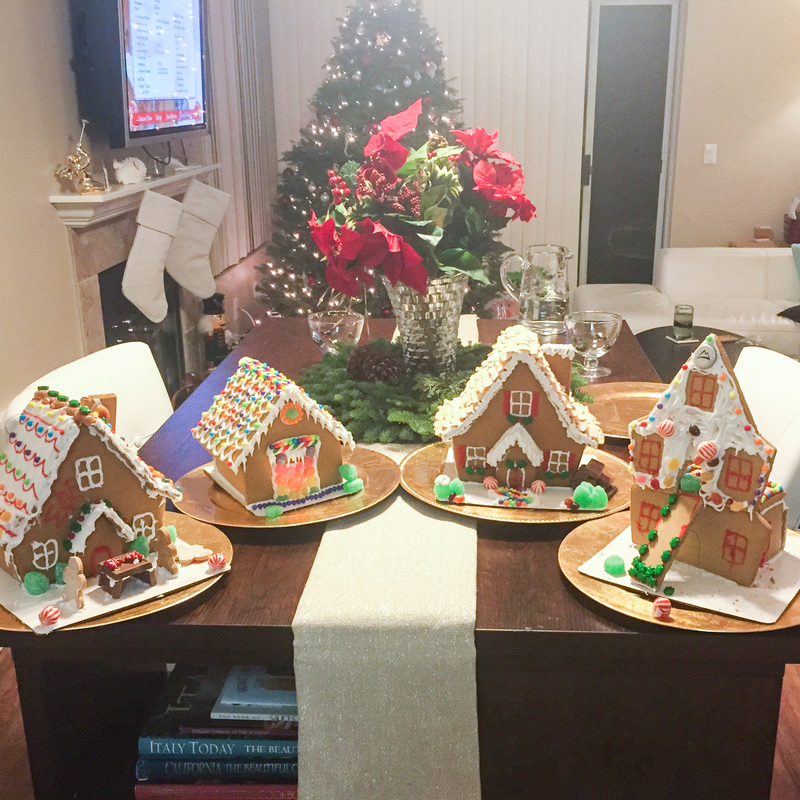 Anyone can have a gingerbread house party, but the contest really kicks it up a notch. Who doesn’t enjoy a little friendly competition? 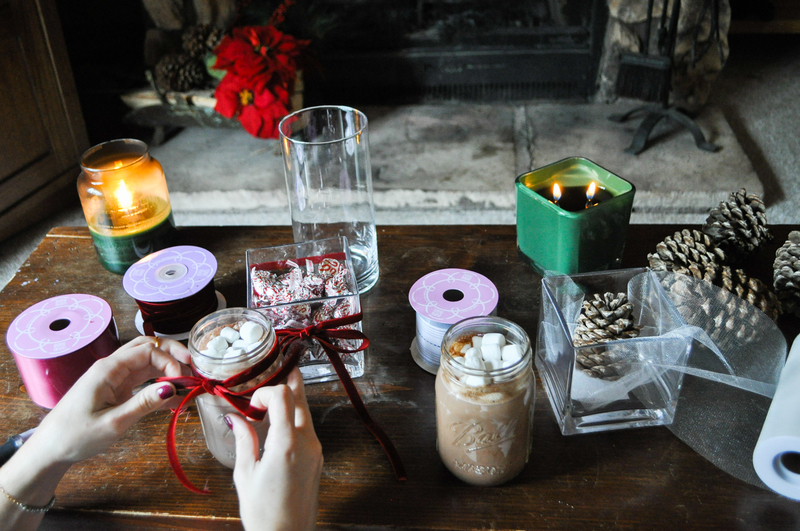 Use the glass vases to display candy (ie, tools for your house) festively, with a ribbon tied around the center. Hang red poms from the ceiling for a Christmassy touch. Then get ready for a bloodbath I mean a lighthearted confectionary competition. PRO TIP: CT Crunch makes Sugar Cookie Toast Crunch for the holidays and they make excellent shingles for your ginger-roof. ALSO PRO TIP: LED garland would make a delightful exterior illumination accessory for your ginger-house. This is a pretty unique alternative to the cookie-decorating party that’s been around for forever. Still very much DIY, but a little more crafty (and less about food). If you’re a maker and your friends are too, this is the perfect get together. Use the sprays of tree trimmings to create a fresh wreath that’s gonna smell nice af. You can add fresh flowers or pinecones if you want, and tie ribbon through it or make a bow at the top – then weave LED garland through it! The wreath is your canvas, dear reader. The wire wreath frames are inexpensive enough that you could provide them for your guests, and the tree clippings are usually free, putting you out very little $. With the lights dimmed for the movies, you’ll have a prime opportunity for some fun illumination. 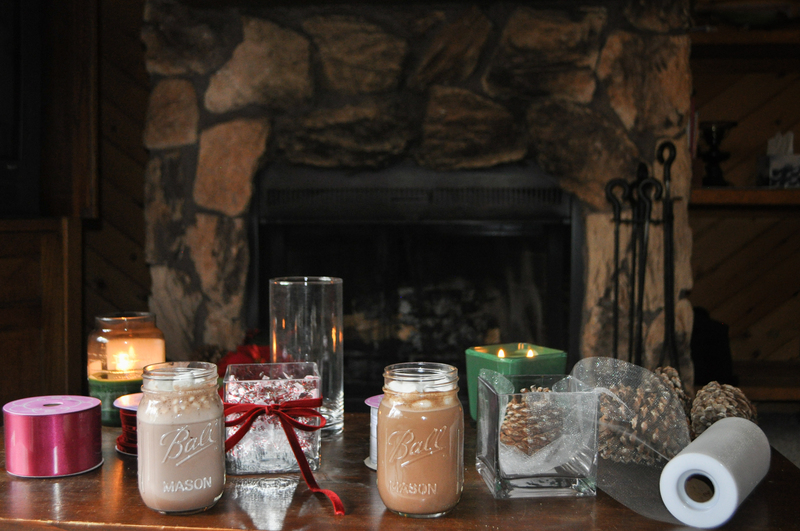 Use white or red LED garland in mason jars and set them up around your mantle for an effortlessly festive addition. Minimal effort, all the cozy holiday feelz. And you can do this on a weeknight, which won’t interfere with anyone’s pre-scheduled list of holiday plans. PS. 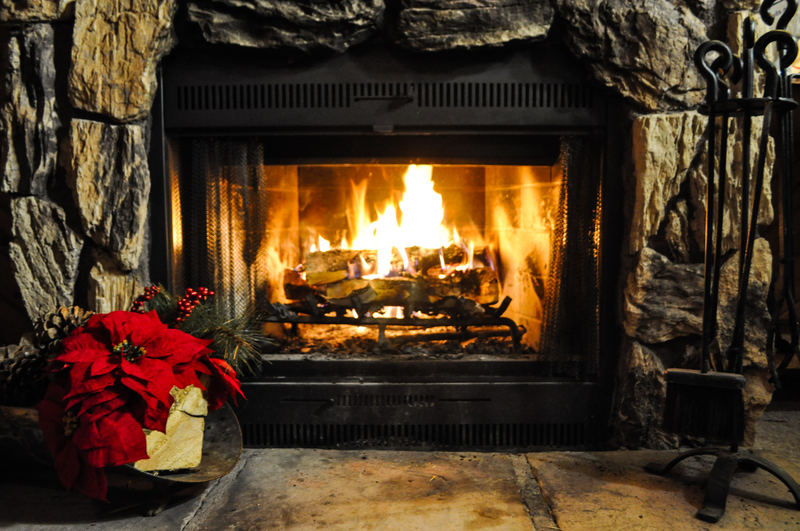 if you have a fireplace, s’mores are always a fun option and the fire will up the cozy factor. This is the great undertaking of all holiday parties. Having hosted a several course dinner party in my home or apartment for the past seven years, I can tell you that this calls for a bit of advanced hosting if you’re going to go full out. If you’re new to the game or nervous, start out with a cocktail party. Simple passed hors-d’oeuvres, a variety of alcohols, a Frank-Sinatra-infused playlist from Spotify…. bingo. You’re golden. For me, I love cooking and hostessing and decorating, so I tend to put a lot into my dinner parties. I plan the menu a month in advance, make fancy invitations, curate a playlist, find a dress, and set up my house for guests – typically with a thought-out cocktail menu as well. Last year a friend played bartender. Yeah. I’d need an entirely separate post to get into all the details of a quintessential holiday dinner party, but for a the basic DIY concepts, here’s what you’ll need: Mason jars with ribbons tied around them for cocktails and cocoa; square glass vases for centerpieces (think vibrant red florals or Christmas candies) – also with ribbon tied around. Use the red paper pom poms as an inexpensive but punchy addition to your decor. No matter what kind of holiday shindig you decide to throw together, try doing a little yourself and saving some money – it’s just as festive and makes it even more special. Merry Christmas and Happy Holidays you guys! I love you all. And if you feel so inclined, let me know what you’re planning for the next couple weeks! I’d love to hear about your parties and see pictures. PS. I’ll be sharing more cozy & snowy pictures from my adventure in Big Bear this week! I can’t wait to show you guys some awesome restaurants and talk about the gorgeous hiking trail we visited. Thank you to Paper Mart for providing the materials for this post!